Add More Energy into Your Life! Have you ever wanted to have more energy, but weren’t sure how to get it? I am a mom and it is safe to say that I always need more energy. Now that I am “getting older” energy does not seem to come as easily as it once did. If you´re going to work without energy, then you should really learn how to prevent worker fatigue here so you can improve your productivity. Parenthood gets busy with school schedules, work deadlines and extracurriculars. Life as a busy mom who also runs a business means a jam-packed day, EVERY day. But, as moms, we are so busy right? Whether you are running errands, cooking supper, making lunches or just trying to clean up the house there is always something that needs to be done. Check out these tips I’ve discovered, over the years, for adding feel good energy into my life. I am always in need of it and I’m sure there are lots of busy moms out there that feel the same way! How do you get your feel good energy once you start to drag during the day? Since I work from home I’m able to jump up as needed to get a break or just relax for a few minutes. I say relax but I never do. I’m always at full force no matter the time of day. There is always something that needs to be done. I do love being able to go outside. It’s more work because I’m always doing something but it’s definitely a nice break from working indoors sitting at the computer. If you plan for the unplanned, you’ll always be ready for whatever “surprise” life hits with you with. You can make lunches the night before, chop veggies and stock snacks in baggies or containers for easy grab and go. Get the kids involved and give them easy jobs to do. It not only gives them a sense of accomplishment, it helps them learn life lessons. When you’re preparing dinner, make it twice, make enough dinner on Monday for Tuesday and Wednesday. Small things can make HUGE differences to your everyday routine. This is something that I struggle, but I know it’s an important one. By waking up early, before everyone else, and getting my work out in—I seem to have more energy. Isn’t it crazy how something that requires energy gives you energy? Trust me, I know this is a hard one, but it makes sense. When you keep hitting snooze, your body keeps falling back into a shallow sleep. Get up and get your body moving. You won’t regret it. Challenge yourself to get moving when you get up in the morning. If you work at a desk, make sure you get up and move around. You will easily get tired if you are sitting at a desk not moving around. Experts say to get up and move around every 60-90 minutes. You need to get your blood flowing as much as possible. If your job doesn’t allow you to get up and move, you should start taking a lot more potty breaks to help your blood flow. Don’t forget to stretch often! Don’t try and go the day without the proper amount of energy. Get your hands on a V8 +Energy®. There are no artificial colors, flavours, or sweeteners. Get this, there is only 50 calories per can. And it’s non-carbonated, so it is perfect for any time of the day. 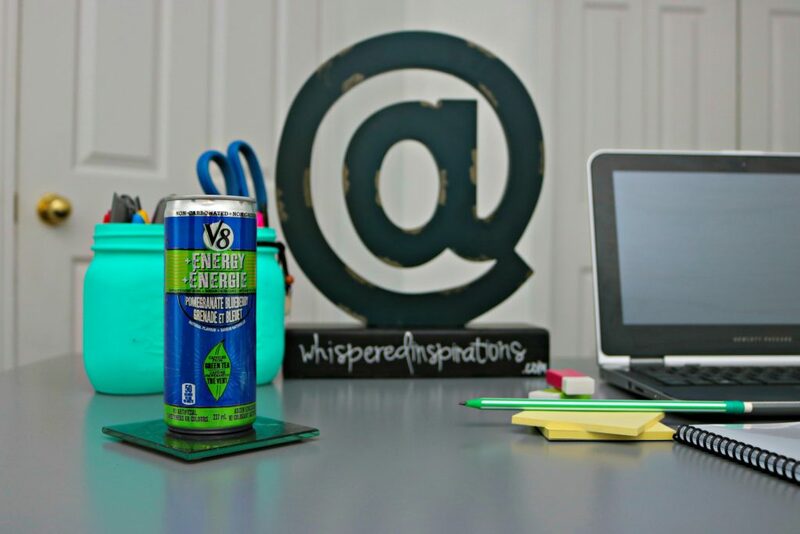 V8 +Energy® is aimed to give you a boost of energy without any of the artificial sweeteners. Trust me, when you’re a parent, a little bit of energy sure can go a long way. That little boost of caffeine is extracted from green tea and each can contains 80 milligrams. There are even two refreshing fruit flavours available – Peach Mango and my favorite Pomegranate Blueberry. V8 +Energy® is available for purchase at all key retailers where other energy drinks are sold. The MSRP ranges from $2.00 to $2.49! I work in an office and behind a screen for most of the day. I try to take at least 20 minutes to an hour every day to get up, grab the dogs and take a walk. 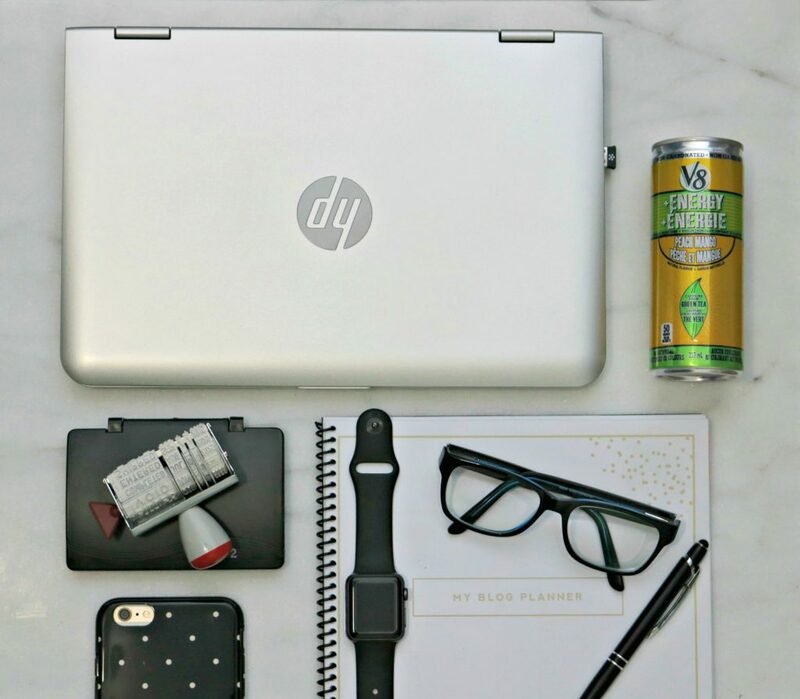 Even if it’s down the street to sit and people watch while sipping on a V8 +Energy®. Take deep breaths, read a book and then take a brisk walk to get the juices flowing. You’d be surprised at how much of a difference this can make to your day. Experts say that we gyp ourselves of about 90 minutes of sleep a night, every night. In fact, we should be getting at least eight to nine hours at night. An easy way to remedy this is to add to your sleep a little bit each night. Go to bed a half hour earlier each night and soon enough, you’ll see that your body will be rested enough to wake up on its own. I tried this method and now I rarely ever need an alarm to wake! Boost That Feel Good Energy. So, on those days where I feel like I never have enough hours to get everything done and I am rushing out the door to get the kids to school and rushing back home to meet a deadline, I remember to try to do at least a couple if not all of the tips above. I hope you enjoy having more energy. Visit V8 for more information about V8 +Energy® drink and connect with them on Facebook, Twitter and Instagram. What is your go to energy tip? Note: The advertised product may not be suitable for everyone. Read the label and follow directions for use for the advertised product. V8 +Energy® © 2016 Campbell Company of Canada. I have a can of this in my fridge from the sample source package,i must give it a try.Good calorie count ! Yes, give it a try when you need a boost of energy. I want to drink this brand of energy drink. Sounds very effective to boost my energy while working. I want to try this brand of energy drink. Looks like it is very effective to boost my energy while working. Especially when the afternoon comes around! I find this energy drink will help me to be more active while doing my tasks. It gives you that boost of energy you need! I need to use these tips badly!! I am so bad about hitting snooze that I have to set my alarm for a good 30 minutes before I actually need to get up. ugh. Hehe, I think we all have those days! My energy level as of lately is on empty. I need to start exercising and taking care of myself. Love your tips for more energy, definitely need it this time of year. Hope they help you out! V8+ Energy sounds like a delicious way to get a boost. I can use all the energy I can get. I will have to pick some up to try. I drink V8 low sodium veggie juice. I didn’t realize they had energy drinks. I will have to give them a shot. Yes, they are so good too! Give it a try! I need to take these tips to heart. I lack energy almost daily. I do know when I was working out I felt a lot better. I need to get back to that routine. I also had the best sleep of my life during that time. It is amazing what it can do! My go to energy tip is to get enough sleep! I try to go to bed early and sleep as late as I can. going to bed early can be hard when there is so much to accomplish! I am so bad ago hitting snooze and regretting it. These are definitely great tips for having more energy. Hehe, I think we all are at some point. But, it is awesome when you do not need to anymore. I actually LOVE working out early/first thing in the morning. It really helps energize me and help motivate me for the day ahead! And you get it over with and you get a nice boost of energy! 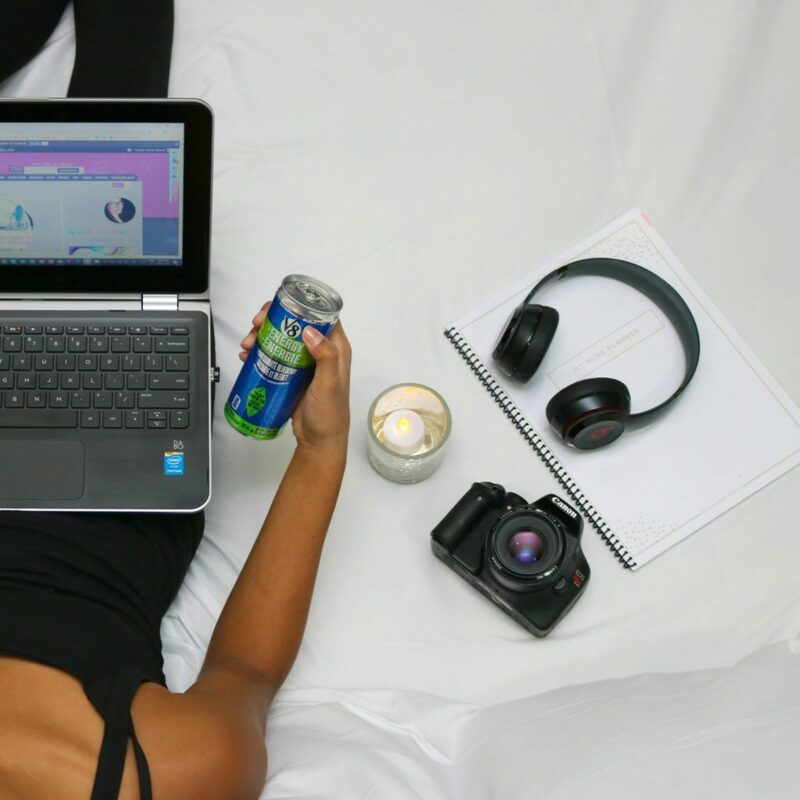 These are all great tips for getting more energy throughout your day! I need to use some of these!! Thank you for the wonderful tips. Fresh air and fruit always does it for me. My go to energy tip is more water less coffee. I found drinking the right amount of spring water per day can really boost your energy. These V8 + Energy drinks are something i am going to have to try drinking for more energy. We love V8 juice and have not yet tried the Energy drinks. The pomegranate and blueberry ones sound delicious. Thanks for sharing the drinks. They are really tasty and I love that they are not carbonated. I have a lot of luck working out after lunch to beat those afternoon doldrums. Hmm, that is a great way to boost some energy also. My husband loves V8 drink! I have never seen this new product line before! It sure gives you an energy boost! I come to really like this drink for a quick boost!